So I was shopping with child no.2 the other day and as we walked past the refrigerated section, she pointed at the packets of ravioli and said "can we have that Mum?" B.T. (Before Thermomix) I probably would have just picked up the packet without a thought (and without even looking at the ingredient / preservative list! ), but in my TM mindset I thought - how hard could it be to make that? It wasn't hard (particularly with the TM making the mixture), but it was a bit time-consuming and fiddly, but the more I made the faster I got, so next time I reckon I could give Jamie Oliver a run for his money! So how did I end up making Chinese style ravioli rather than the Italian type? Well my daughter actually wanted to eat it in a broth style soup rather than with a sauce, so I thought a wonton in the shape of ravioli would make sense, and also I had just seen a wonton wrapper recipe in the new A Taste of Asia TM cookbook so I was doubly inspired to give it a go. Using my pasta maker to roll out the wrappers made them fabulously thin - just remember to use a lot of flour to prevent it sticking. I didn't have any pork in the freezer (which I understand is the traditional wonton filling) so used chicken thighs instead and took my inspiration from a recipe by Honey and Spice. 1. Place mushrooms in a bowl of hot water. 2. Place cabbage and salt in TM bowl. Chop on speed 5 for approximately 5 seconds or until all cabbage is finely shredded. Use spatula to assist if necessary. 3. Place rice basket into a slightly larger bowl and place cabbage inside. Set aside to allow the water in the cabbage to leach out. 4. If you are making your own wonton wrappers, give the TM bowl a quick rinse and then make wonton wrapper dough. Set aside. 5. Place chicken into TM bowl. Mince on speed 7 for 10 seconds. Set aside. 6. Place ginger, garlic, spring onions and garlic chives into TM bowl. Chop for 3 seconds on speed 7. 7. Squeeze water out of mushrooms and add to TM bowl. Chop for 3 seconds on speed 7. 8. Squeeze water out of cabbage and add to TM bowl, together with chicken, sesame oil, soy sauce and white pepper. Mix for 5 seconds on reverse speed 4. 9. 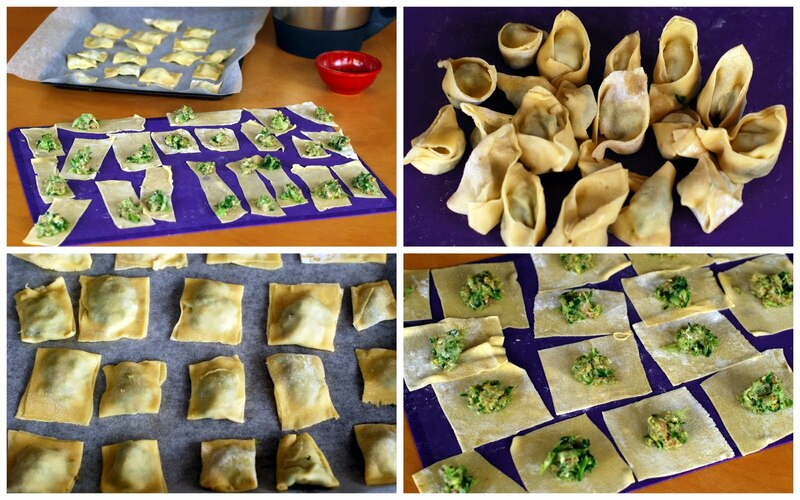 Place mixture onto wonton wrappers and make any shape that you want. 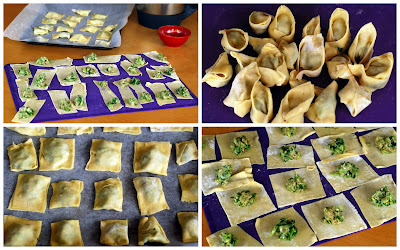 Check out this website for wonton folding techniques. 10. Cook in hot soup for 3 to 4 minutes or freeze for another day. Good job on the folding…. Thanks Tenina. I am thinking that eating these with your chilli jam might spice them up a bit!